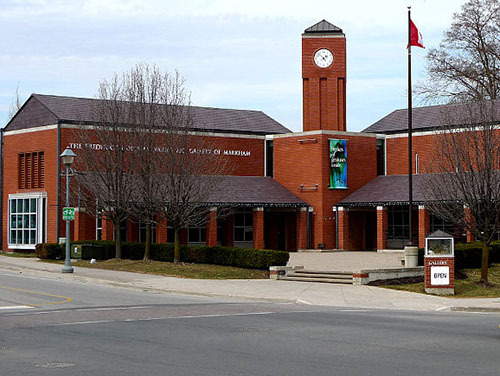 The Frederick Horsman Varley Art Gallery of Markham is conveniently located in the historic village of Unionville, only 20 minutes from major highways and the City of Toronto. Situated at the northwest corner of Main Street and Carlton Road, the Gallery is a focal point of the heritage district. In addition to the Gallery, Main Street Unionville offers visitors a unique combination of trendy retail shops, architecturally significant historic homes, and inviting urban parks. The Varley Art Gallery of Markham features frequently changing exhibitions from the permanent collection as well as historical contemporary exhibitions drawn from local, national and international sources. New ways of seeing and appreciating art are enhanced through a broad range of dynamic hands-on art-related activities, including group tours, school programs, studio art classes, workshops and lectures, and family activities, designed to appeal to audiences of all ages and interests. The gallery encompasses the historic Kathleen McKay house dating from the 1840′s (now the McKay Art Centre) that became the home of Frederick Horsman Varley for the last 12 years of his life. Varley died in 1969. Through a generous gift by Kathleen to the Town of Markham, the Town and a group of dedicated volunteers undertook to build a 15,000 sq’ gallery just doors away from the historic house on Main St. Unionville. Today historic village of Unionville and the Varley Art Gallery represent the second most popular tourist attraction in York Region while serving the visual arts needs and interests for the people of Markham. Tuesday, Wednesday, Friday and Sunday 11:00 a.m. to 4:00 p.m. If you have any questions, comment or concerns about this website, please contact the Website Administrator.